After being destroyed in the Holocaust, two pre-war mikvaot are discovered in Vilna. An international team of archaeologists recently discovered two pre-war mikvaot (ritual baths) in the city of Vilna, Lithuania. The mikvaot are part of the Great Synagogue's compound. The team of researchers included Israel Antiquities Authority researcher Dr. Jon Seligman, Lithuanian Cultural Heritage Organization's Mantas Daubaras, and Hartford University's Professor Richard Freund. Vilna's Great Synagogue, built in the 17th century in Baroque-Renaissance style, was a large community center and a center of Torah study. It was at the heart of Lithuanian Jewry and included 12 synagogues and study halls, mikvaot, the community council building, and kosher meat stalls. The Vilna Gaon, Rabbi Eliyahu, also had his study hall at the site. Three hundred years after its founding, Vilna's community was decimated and its synagogue looted and burned by the Germans. Later, the synagogue's remains were removed, and the site was used for a school. Last year, a study showed evidence of underground spaces in the area. This led to an excavation of the site and the exposure of the ritual baths. In July of this year, a team of Israeli, Lithuanian and American archaeologists unearthed the remains of two mikvaot used by congregants at the Great Synagogue in Vilna, today the capital of Lithuania. According to Seligman, "Most of the historical descriptions of the Great Synagogue in Vilna and the community courtyard (the Shulhoyf) relate to the Great Synagogue and the surrounding prayer halls." "Until now, we have found little information about the bathhouse and mikva building of the Jewish community, a community that comprised almost half of the city's population." 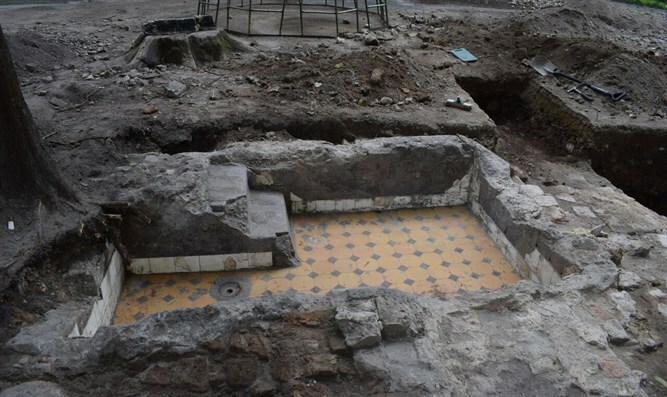 The excavation followed an architectural plan from the end of the 19th century, which included details for the restoration of the original bathhouses by the community. According to the plan, the bathhouse consisted of two main floors, many rooms, and a large service wing. It was also possible to identify two installations that were built as ritual baths. This plan, discovered in Vilna's municipal archive, guided the researchers during the archaeological dig. The two installations discovered are of the final phase of the mikvaot, which date to the early 20th century. They have tiled walls and floors, steps leading to the pool and an otzar. The otzar is an auxiliary pool in which rain water is collected for the mikva, in order to make it kosher for ritual purification. "These discoveries add a new dimension to the understanding of the daily lives of the Jews of Vilna, and will certainly provide a new focus for understanding the lost cultural heritage of the Jewish community of Vilna, the 'Jerusalem of Lithuania," the researchers said.